A cold climate air source heat pump (ccASHP) can help you save energy and money when it’s well-sited and used as directed. ccASHPs are highly efficient systems and provide both heating and cooling through the same system. April 2019: We're hoping to offer a heat pump group-buy program this summer. Are you interested in a heat pump? Help us target your community by taking our 2 minute survey. 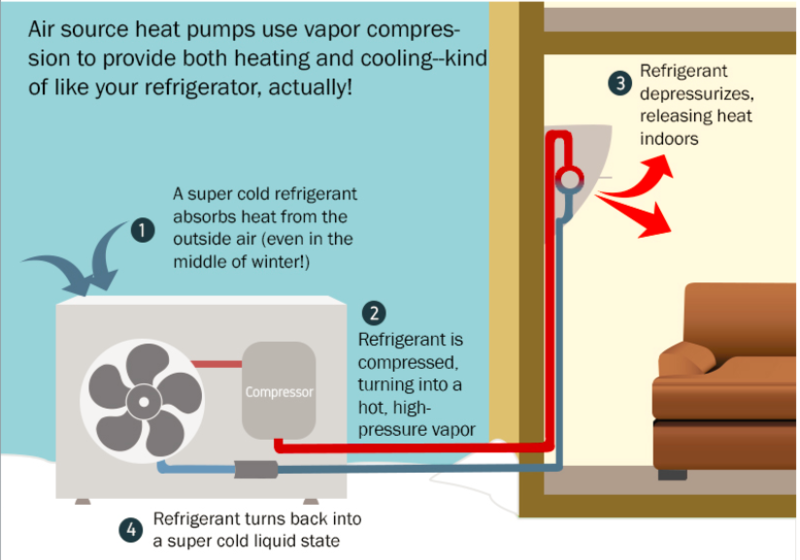 What is a cold climate air source heat pump? Who should install a heat pump? Unlike traditional heating systems that burn fuel to generate heat, a heat pump moves heat into or out of a building or space using electricity. This transfer of heat, rather than combustion, makes heat pumps a highly efficient option for heating or cooling your home. The best type of heat pumps for New England are cold climate air source heat pumps (ccASHPs). The ccASHPs can heat efficiently even when temperatures dip below freezing, and they cool more efficiently than conventional air conditioning systems. Heat pumps benefit some households more than others. There are many factors that determine whether installing a heat pump makes sense, including a home’s layout, the home’s current heating system, a home’s energy usage, and whether or not the home uses air conditioning. Heat pumps are most often used as a supplemental source of heating and cooling and are not a replacement for your central system. Heat pumps run on electricity, so to figure out if one is affordable for you, you may compare the projected reduction of your current heating fuel to the projected increase in your electricity usage. 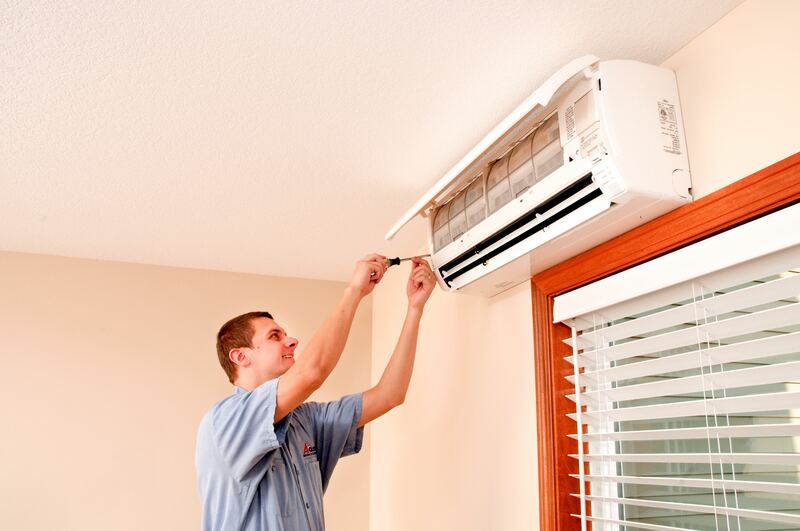 If you are replacing an older air conditioner, you may also factor in the change in kilowatts needed to keep your comfortable in summer. ccASHPs provide both heating and cooling through the same system. In homes with more than one indoor unit spread out across the house, homeowners can have direct control over the temperature in various parts of their homes. ccASHPs are highly efficient systems and can save homeowners money on both their heating and cooling bills. ccASHPs can provide significant savings over electric resistance or propane heat and are significantly more efficient than conventional air conditioning systems as well. Depending on what you use to heat your home, ccASHPs can pay themselves back in a matter of years. High-efficiency ccASHPs can help you and your family reduce your greenhouse gas emissions. Significantly lower energy usage in the winter and summer will contribute to reducing your carbon footprint. Of course, if you green 100% of your electricity through our Green Powered program, then there are no emissions when you use ccASHPs! If you're used to hearing radiators creak in the winter and using loud window air conditioning units to cool off in the summer, ccASHPs will be noticeably quieter while still providing reliable heating and cooling. ccASHPs filter and dehumidify air, improving indoor air quality and comfort. Heat pumps are most likely to be cost-effective if you currently heat with electricity or propane. If you heat with oil, heat pumps may be a good supplemental heating system for all but the coldest days of winter. If you currently heat with natural gas, heat pumps may be a good supplemental heating system for sections of your home that are not currently getting sufficient heat from your gas system (i.e. renovations to basement, attic, or additions that were not factored into the sizing of your heating and cooling system). Mass Clean Energy Center's "Learn About Air-Source Heat Pumps"
If you are ready to start collecting project bids, fill out this survey to stay updated on Green Energy Consumers' next heat pump group-buy program.